This rendering of a new Rock Region METRO shelter is similar to the design of the coming solar-powered shelters coming in 2016. 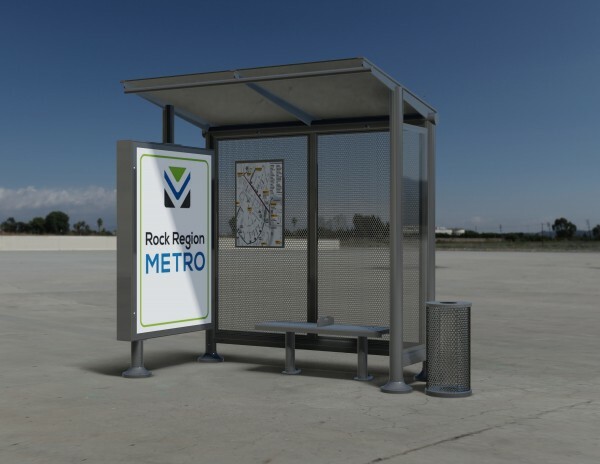 Rock Region METRO has been awarded a $360,000 Transportation Alternatives Program (TAP) grant to purchase and install 25 new solar-powered shelters. Each shelter will have solar-powered lighting, a bench and a small bike rack. The total project cost is $450,000, with Rock Region METRO providing $90,000, or 20 percent, of the cost with local funds. This is the agency’s first TAP grant award. The TAP is a federal aid program established in 2013 that provides funding for construction of on- and off-road pedestrian and bicycling facilities, including lighting, and other projects defined as transportation alternatives. The Arkansas Highway and Transportation Department administers the program within the state. The 25 shelters will be ordered and installed in 2016 and placed in locations of high importance based on ridership. “We are proud to bring enhanced public transit amenities to the communities we serve as we pursue more investment in this essential service,” said Allie Freeman, chairman of the Rock Region METRO Board of Directors.